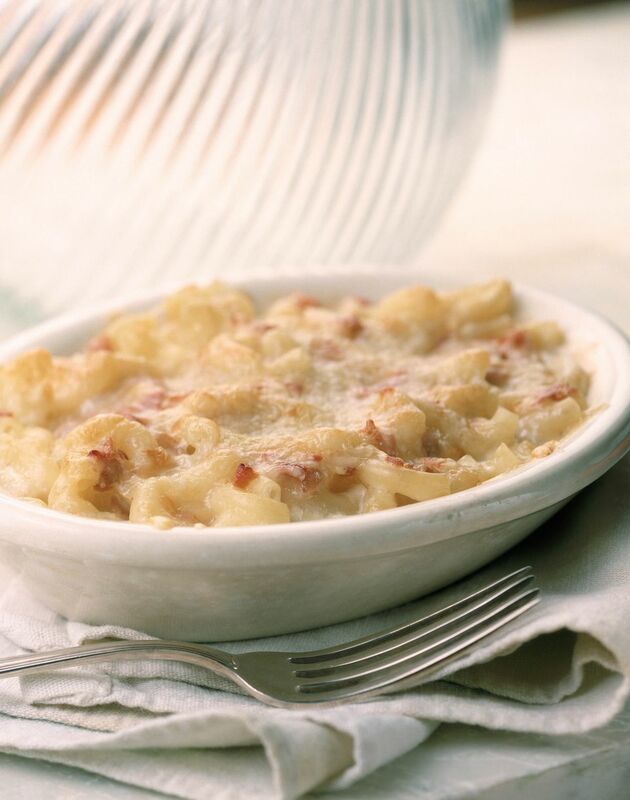 This cheesy, creamy macaroni and ham casserole is the perfect comfort food. It's also a great way to use up that leftover holiday ham. If you would like a little extra color and flavor, add some vegetables to the macaroni mixture. Peas, broccoli, peas and carrots, corn, or mixed vegetables are all good choices. If you don't have pimientos, feel free to omit that ingredient or use roasted red bell peppers. Or add some chopped red bell pepper to the green bell pepper to give it that burst of color. Or saute some mushrooms along with the onions and bell pepper. For a heartier one-dish meal, add extra ham and top it with more cheese. Swiss cheese or a cheddar jack blend are excellent choices as well. Serve the casserole with a basic tossed salad or steamed vegetables and biscuits or dinner rolls. A breadcrumb topping is another good way to elevate this dish. See the tips for more. Grease a 2 1/2-quart casserole dish. Heat the butter in a large skillet over medium heat. Add the onion and cook for about 3 minutes, stirring constantly. Add the bell pepper and cook for about 2 more minutes, or until the onion is translucent. Remove the vegetables to a plate and set aside. Add the diced ham to the skillet and continue cooking for about 3 minutes, stirring frequently. Bring a medium saucepan of water to a boil over high heat. Add the elbow macaroni and 1 teaspoon of salt. Stir and lower the heat to medium-low. Cook following the package directions. Drain well. In a large bowl, combine the cooked onion, bell pepper, and ham with the drained macaroni, pimiento, cream of mushroom soup, pepper, 1/2 cup of milk, and the parsley. Mix to combine the ingredients thoroughly. Transfer the macaroni mixture to the prepared baking dish. Bake in the preheated oven for about 30 minutes, or until it is hot and bubbly. Sprinkle with the shredded cheese and continue baking just until melted. For a buttery breadcrumb topping, combine 1 cup of soft breadcrumbs with 2 tablespoons of melted butter. Stir the cheddar cheese into the macaroni mixture and sprinkle the breadcrumbs evenly over the top. Bake as directed, or until the topping has browned and the filling is bubbly. Or add a few tablespoons of grated Parmesan cheese to the breadcrumbs.